Be sure your dog is standing straight and level with head up, looking forward and legs square. Be sure your dog is not hunched over or in a crouching position. It is helpful to have someone assist you while measuring your dog. They can distract your dog with treats or toys and keep their attention while you measure. They can make sure your dog is standing "square" (straight and looking forward), which will help you obtain consistent and accurate measurements. Using a SOFT measuring tape, measure the dog, not the fur. Be sure to pull the tape snug against your dog's body, particularly with dogs with heavy coats. When going from "Point to Point", keep a finger on each point. For example, when measuring Point A to B, then A to C, keep your finger on Point A, when doing both of these measurements. Do not pull the tape tight or the measurement will be short. Provide your dog's breed, build and weight if possible. This helps us determine if your measurements are correct. If we have a question regarding your measurements, we will contact you. Proper measurements are very important! Measure three times to be sure! Point A to Point B. Measure from top of breast bone in front (Point A), to the point of the withers at the base of neck, located right in between the shoulder blades (Point B). Measure one side only and double it for the measurement. 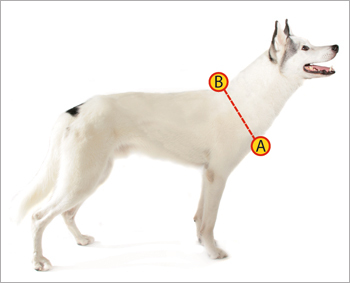 Point A to Point C. Measure from the top of the breastbone (Point A), down between the front legs, to the mid-point of the rib-cage, on the belly of the dog, which is right where the sternum ends (Point C). Basically, you are measuring the length of your dog's sternum. 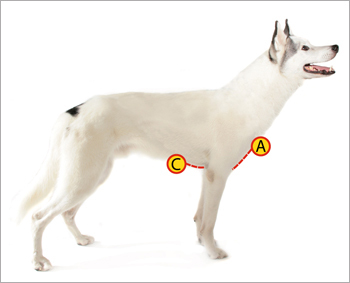 Note that there is some leeway with this measurement - as long as Point C is not measured past your dog's sternum OR too close to your dog's front legs, then it is a good measurement. 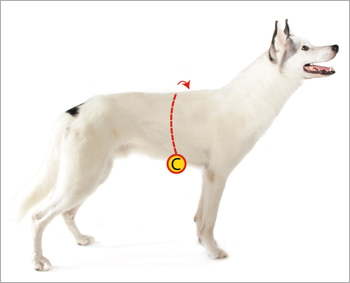 Point C to Point C. Measure around the widest part of your dog's mid-section (Point C).